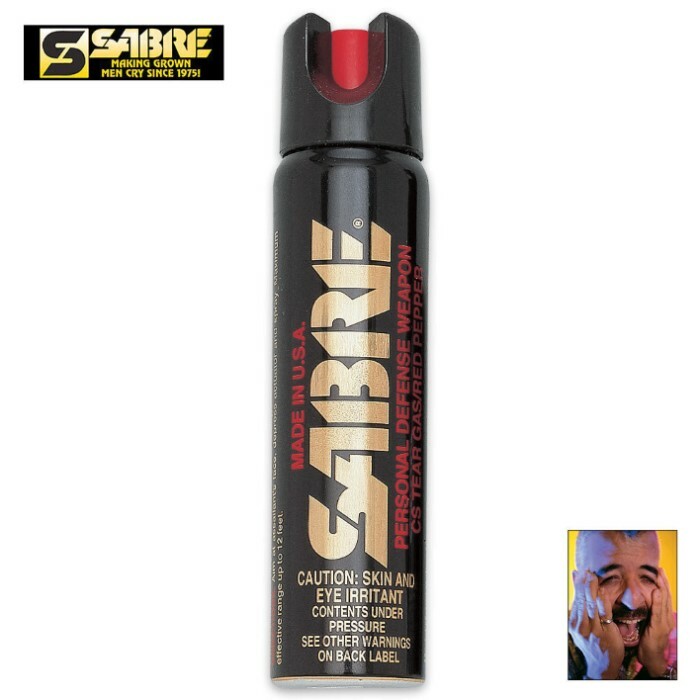 Sabre Red Police Magnum Self Defense Pepper Spray - 110 g | BUDK.com - Knives & Swords At The Lowest Prices! Sabre Pepper Spray totally incapacitates one or more attackers for 10 to 15 minutes. The eyes close involuntarily, the nose runs and moist skin stings. One shot causes instant panic and agony! The effects are immediate and severe, creating a burning sensation in the eyes with copious tears, coughing and difficulty breathing. Now, that is peace of mind you just can't put a price on! Get it now! Living and working in rural Colorado and New Mexico, this also works on a big dog attacking, I've successfully thwarted a bear. When the owner of the dog hears the words "...I could have legally shot your dog with my pistol and it would be dead..." , seems to calm them down in a split second, simply put: "This Stuff Works"
I bought this product for my wife.I haven't seen this product in action, though my wife has. A couple of heroine addicts where harassing a cashregister attendant who is a friend of my wife. My wife lent her the sabre magnum pepper spray and results. They said all he screamed was it burns. I don't feel sorry for any man that has the guts to pick on a lone woman and act macho about it. Then he had the nerve to say using pepper spray is illegal. Oh like picking on a woman isn't. Sometimes justice is not served, it is taken. I had some of this and sprayed it outdoors to see how far it would go. Problem was I was downwind. Just the light mist that blew back was enough to have my eyes watering and starting to gasp a bit for breath. Also got the itchy face but no runny nose. I say good stuff. This spray is GREAT... because: It's regular size, perfect for spray holster belt + VERY GOOD security button (just turn and ready!) = no accident.